I finally gave Davey the Hubbers a chance to speak and regale us with all of his thoughts about the delicious, bountiful, beautiful fall soup that he created. I decided to sit down and interview him, because, let’s be honest, I thrive with control. Hi Guy Guy McGuygersteen! Man, you made some delicious soup. I told you I wanted to bathe in it, and even though you had some other bathing ideas, I still sort of mean it. What gave you the idea? Fall is a great time for chefs. There are so many options for creativity. Pumpkins come in so many varieties and are very versatile. Now about them cranberries? What makes them so unbelievable? And how hard is that to duplicate? The cranberries were very simple. I used balsamic vinegar, champagne vinegar, sugar and water. I just let them simmer for a while until they became plump and began to burst open and allow their flavors to bloom (editor’s note: I felt like I was reading a romance novel for a second, and I didn’t hate it at all). I stirred them some to slightly mash them while leaving them slightly whole for the texture i desired. What is your favorite part about being in the kitchen at home? My favorite thing at home is that I can completely screw something up and no one needs to know about it. I can cook with complete confidence and not worry about making mistakes. What is your favorite part about being in the kitchen with me? Trick question since you don’t enjoy our co-existing time in the kitchen. I am doing much better about having you in the kitchen with me (editor’s note: the clenched jaw that surfaced while answering was all the proof I needed). 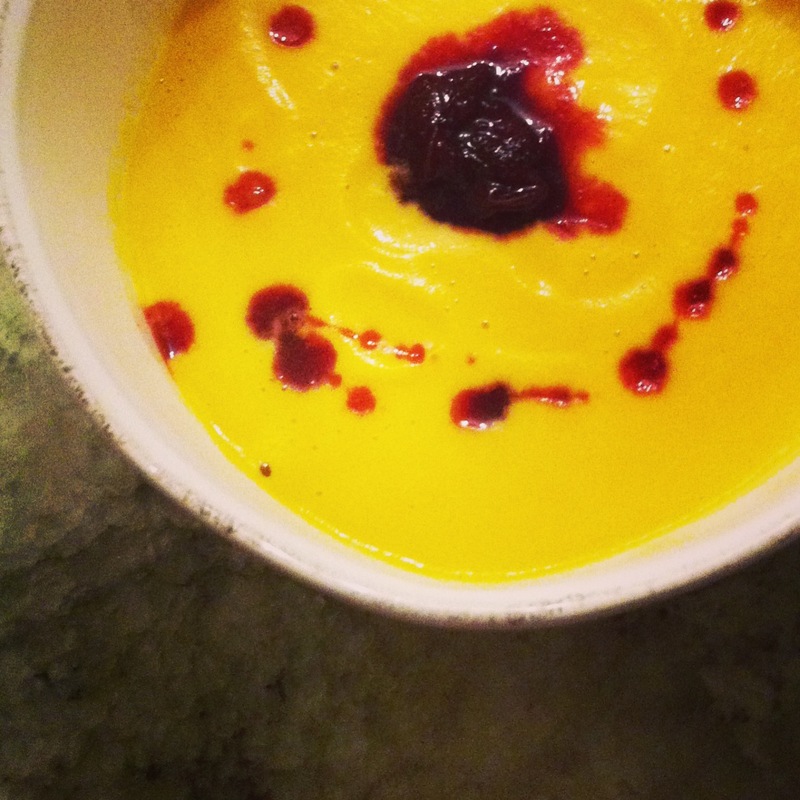 What is your favorite grown up beverage to pair with this soup? I’d definitely pair something bold with this soup. I recently tried the Port City porter, and it is now my favorite beer (editor’s note: shout out to Sir Edmund Halley’s – our favorite local spot and the scene of this weekend’s late night date night featuring said porter and a massive plate of jerk chicken nachos). I could enjoy a pint of it with this soup. Why are you so freaking cute? Very bizarrely this question was left blank. Come on, guy, the public needs to know! You gotta shake what your momma gave you! Slice pumpkin and/or squash into large wedges (I quartered the pie pumpkins, for reference) and arrange on large baking sheet or roasting pan. Roast at 275 for 60-90 minutes – begin checking after an hour. Remove from oven, allow to cool slightly, then scoop out “meat” with a spoon. Transfer to small stock pot. Simmer in stock pot with 1/4-1/3 stick of butter (depending on preference), 2 cups of stock and 1/2 qt. of heavy cream (you could also use half and half to lighten it) until butter is melted, and mixture is desired temperature (the butter and cream will cool the pumpkin and squash, so just bring it back up to temperature). Add maple syrup and sea salt. Transfer to blender and process until smooth. Serve topped with agro dolce cranberries explained above.